#michED: The PureMichigan of Education | Gary G. Abud, Jr. This entry was posted in Education Learning MichEd Teaching and tagged Education Learning MichEd Michigan Teachers Teaching on June 13, 2014 by Gary G Abud Jr. It was a cool morning in Lansing during October of 2012. Lining the halls of the Capitol Building, like a science fair, were displays for the AT&T/MACUL Student Technology Showcase. Children from all over the state, some as young as five, were demonstrating how they use technology as a tool while learning everything from music composition to calculus. Some of my students had been invited to present on how we used cell phones and tablet computers to learn chemistry. It was an honor to be included in this event with classrooms from all over Michigan, and to see the innovative ways Michigan students were leveraging technology to support learning. At the end of the exhibit hall, a man with a microphone named Brad Wilson, an educator in Jackson, approached us to talk about our presentation. Like any other reporter that day, Wilson wanted to chat with us about our project; however, this interview was not going on the evening news or in the local paper. Brad Wilson is not a reporter for a news outlet. He is one of the driving forces behind a grassroots effort to capture and share the heart of Michigan education, known as “#michED,” and he wanted to include our class in the first ever #michED podcast. The volunteer-based #michED project seeks to connect classrooms across Michigan by spotlighting the stories of passionate educators and students. Many of us likely have seen or heard the PureMichigan ads running on air; we know that this campaign promotes some of the greatest sights and experiences from the region. For education in our state, #michED is the equivalent of PureMichigan–it showcases points of pride from Michigan classrooms. During our interview with Wilson, the students talked about how using their cell phones makes learning accessible during and beyond class time. They also discussed what makes learning fun, what good teachers do to help them learn, and what their dream school looks like. The students said it all involves getting “hands-on” with learning. That’s #michED. The #michED movement has been gaining momentum since 2012 and has developed into its own social brand. It has cultivated a culture of collaborating, connecting, and sharing among thousands of Michigan educators. There are three major elements of #michED: social media connections, meetups, and a podcast. Social media connections let educators interact, converse, and share in a digital way. Using Twitter, the #michED hashtag allows individuals to share relevant educational news, classroom stories, or thoughts. By following the hashtag, others can easily keep up with the ongoing conversation and learn from one another. A hallmark of the social media connections happens live online Wednesdays at 8pm—the Twitter chat—where educators converse on a variety of education topics. 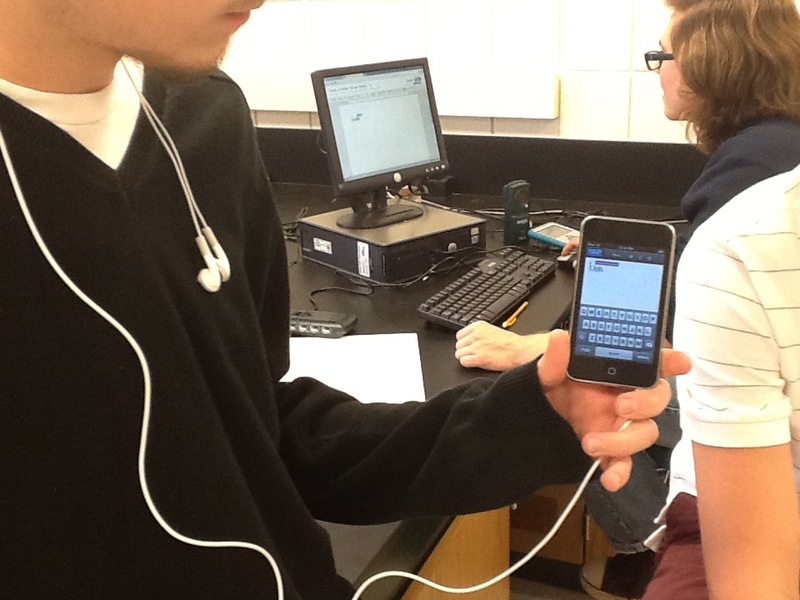 Along with transcripts of the chats, blog posts about teachers’ classrooms are viewable through the michED.net website. Jeff Bush, a Grand Rapids teacher, and half a dozen other volunteers, head up the weekly #michED Twitter chat. They help select topics and questions, but their efforts also manage the chats in real time. 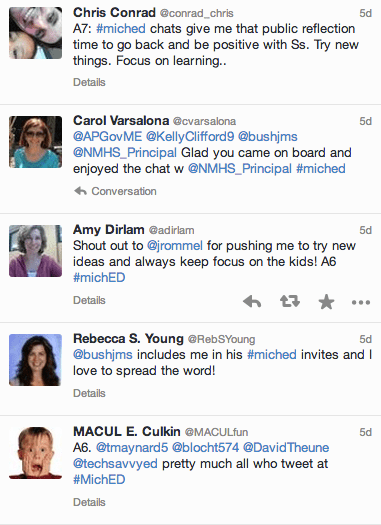 The digital learning network that has grown out of the #michED Twitter chat has become extensive. It invites educators to contribute their thoughts from anywhere on practical issues and some of the big questions of education. By sharing ideas through Twitter and the weekly live chats, educators learn from one another in a personalized way–when and where they want. That’s #michED. Another, more traditional way of connecting through #michED is through meetups, which are in-person events that take place at education conferences or during informal regional gatherings of educators in the community. The digital nature of #michED helps to connect educators across distances, but sometimes it can be nice to put a face with the screen name and have a tableside exchange as well. Grade 1 teacher, Erin Mastin, from Boyne City joined other #michED colleagues for a meetup during a conference in Grand Rapids. Some of the attendees had never met in person, but had been conversing at length on Twitter. Feeling much like pen pals meeting for the first time, Mastin described #michED as “being connected” to others in the profession and their classrooms. The meetups, she said, are an opportunity to “listen and learn openly.” The most valuable part of the experience, for Mastin, is finding resources from educators all around the state, many who are complete strangers. That’s #michED. The #michED podcast, which is free on iTunes, is an online radio show produced by Brad Wilson that is much like one you might hear on NPR. Stories and interviews come from all over the state, documenting classroom projects, lessons, and ideas on educational topics. 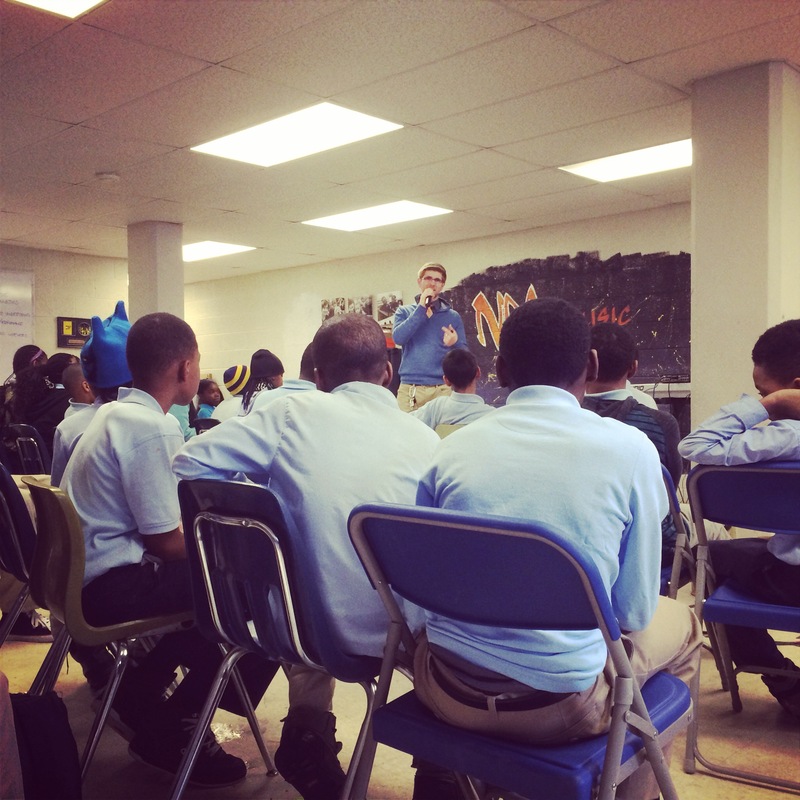 Take the story of Joe Vercellino’s music class at Northpointe Academy in Highland Park. Vercellino’s classroom and students were featured for their innovative use of music to foster creativity, build community, and extend learning beyond the school day. Elementary and middle school students have taken what they’ve learned in their music class and applied it to forming an after-school music group, called Beasts of the Beat. These students have written their own original music, performed at COBO Hall, and recorded an iTunes album. That’s #michED. Capturing and sparking real conversations about learning from those who are in classrooms and schools every day, #michED helps students and teachers celebrate innovation and success in Michigan schools. Ben Rimes, an educational technology director from Mattawan, is another key organizer in making the movement a reality. According to Rimes, “social media allows us to connect and share our story.” Sharing the stories of students and teachers around the state, says Rimes, “helps to inspire other educators and the community.” He notes that it sparks conversations, which might not otherwise have a way to take place, about great ways to foster student learning. That’s #michED. Though the #michED movement is made possible by the educators mentioned above, many more, including Tara Maynard of Zeeland, Boyne City’s Rebecca Wildman, Kit Hard in Port Huron, Todd Bloch of Warren, and Rachelle Wynkoop from St. Clair, work to advance its mission. Since I first came across #michED in 2012, it has sparked a renewed sense of pride in Michigan education and its impact continues to grow. This past month, the #michED team took the campaign to the next level. They issued a month-long challenge to classrooms around the state to share a success from this year in one form or another to the michED.net website. They could leave a voicemail, create a video, send a tweet, compose a blog post, or send an email. A middle school class from Adrian participated by creating a YouTube video highlight reel of their year learning French. The video creatively showed the French food, language, and culture they got to experience in class. That’s #michED. Today, #michED remains free and accessible to anyone interested in joining the conversation; moreover, it is recognizable to teachers in every region and even non-educators who take interest in our schools. At the Governor’s Education Summit in April, #michED was part of a featured presentation about the great things happening in our classrooms around the state. This is about connecting people and sharing remarkable stories. Like PureMichigan for education, that’s #michED. ← The 2014-2015 Michigan Teacher of the Year Is @MelodyArabo!